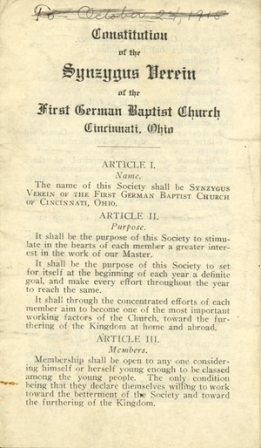 The Constitution of the Synzygus Verein of the First German Baptist Church, which appears to have been adopted prior to 1915. The records of the First German Baptist Church or Deutsche Baptisten-Kirche of Cincinnati have been fully processed and a finding aid is now available on the OhioLINK Finding Aid Repository. 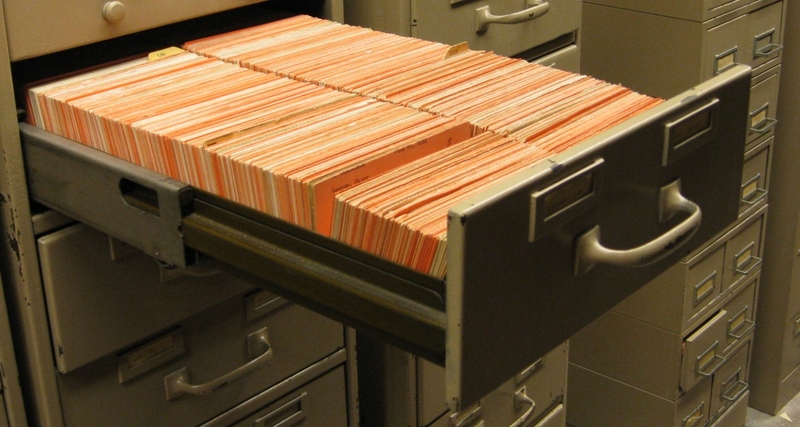 The collection holds various records for the church between 1880 and 1991 including church meeting minutes, financial records, and Sunday school attendance sheets. The material in the collection prior to the 1930s is primarily in German. Carl Helmecke with his wife Mildred and daughter Roberta in Philadelphia in 1919. The German-Americana Collection at the University of Cincinnati Archives and Rare Books Library holds a wealth of materials on German immigration to the United States and the experiences of these immigrants once they were here. Two collections that document the experiences of one of these families are of the Helmecke family. These collections span from the father’s immigration to Cincinnati in 1902 to the beginning of his son’s academic career in Colorado in the 1930s. In 1902, Stephen Helmecke of Braunschweig, Germany came to the United States to work for the Globe Wernicke Company, a library furniture company located in Cincinnati. Stephen’s wife, Marie (Engel), and his two children, Carl Albert and Marie Gertrud, followed him to the United States in 1903. The family lived in Cincinnati for five years before moving to Grand Rapids, Michigan where both Carl and Gertrud attended the University of Michigan. Carl eventually received his Ph.D in German and taught at Western State College in Gunnison, Colorado. Gertrud became an osteopathic physician, and was the first woman elected president of the Ohio Osteopathic Association. In 2004, after 90 years, the City of Cincinnati’s Municipal Reference Library was about to come to an ignominious end, consigned to the dumpster. With the active involvement of city planner Skip Forwood and UC history professor Judith Spraul-Schmidt, the bulk of this valuable collection of urban resource materials was rescued and given a home in the Archives & Rare Books Library’s Urban Studies Collection. Now, it is catalogued and available once more for research. A new digital collection is available at the University of Cincinnati Libraries Digital Projects Web site.